Creating an original species and everything that comes with it can be a daunting task, but it's also a fun task as you get to be creative. How big of a task it will be depends entirely on you and how original and creative you want to get. The task could be small, like creating a new version of an elf, but it could also be enormous, like creating a completely unique and original species of aliens with all sorts of weird physical traits. But like every big task, you can make it easier by turning it into many smaller tasks, which is what I'll be doing in this guide. I will cover the biggest and/or most important factors which'll impact the end result. I've also created a guide on creating animal species, right here. The biggest difference between these two is that there's a whole lot more to cover for animals, for example, for humans and elves you won't have to think about their position in the food chain, they're smart enough to be at the top or at least smart enough to avoid the top predators if they're ranked lower. Original, alternative version, or a hybrid? Original, alternative version or a hybrid? Before we start to create a species we'll have to get a rough idea of what we want. Do we want to simply alter an existing fantasy species and make it our own, do we want to create a hybrid of two or more species (like a mix of orcs, centaurs and angels) or do we want to create something completely original? The choice will depend both on how original and creative you want to get and on how much work you're willing to do. There's also the issue of restrictions with the first two choices. Creating an alternative version of an elf is great, but people have a general idea of what an elf is. Pointy ears, often slender and/or muscular bodies and often magical in nature. 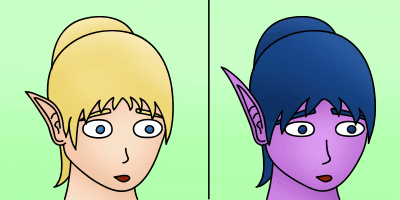 Taking away the pointy ears will generally create something which is often no longer considered an elf. The same is somewhat true for hybrids. You may have mixed a couple of species together, but the view people have of the original creatures might still have to shine through if you rely (too much) on those aspects, especially when you describe them. But there's a whole lot more freedom when creating a hybrid. You'll have the most freedom when creating an entirely new species. Your rules, your imagination and your creature, but also your work. Some will love this, others might think it's too much hassle. The choice is yours. We're now at the point at which we'll design our species, which is arguably the hardest part, especially if you have a creative block. But the same old rule of turning a big task into smaller tasks will apply here. Start at one end and work your way to the other. In the case of creating a species it'll likely be either its head or its feet, if it has any. But where to continue from there on? Well, one way to create a species is to simply try out bits and pieces and see if they fit, if nothing else it'll at least give you ideas and inspiration for what you do want. Another way of creating a species is to design it from a survival point of view. What would your species have needed to survive in its natural habitat before it was intelligent enough to bend the world to its needs. Most survival aspects can be toned down a lot since they're no longer needed, over time they would've declined just like how, for example, human body hair has declined. We start at the head as that's often one of the most prominent aesthetic features of any species. I want it to have hair, mostly for aesthetic purposes, but I only want head hair, no facial hair. The eyes will be big, the species is slightly nocturnal and would have developed big eyes naturally (or highly optimized eyes, like cats). It's another choice which is mostly affected by aesthetics, but it also makes sense from a survival point of view. Skipping ahead to the torso, it's long, slender and muscular. This species is agile and fast and would need a slender body for that. Its limbs are slender and muscular as well, the legs wouldn't need to be thick and strong to support its torso, so it won't make much sense to give it big legs. Its hands and feet are quite large and both have strong, thick nails which allow this species to climb more efficiently and just helps with grip in general, which is again helpful for agility and speed. Obviously this isn't a full description, but that would take up too much space. The point was to illustrate how I think about creating a creature from scratch and hopefully it'll help you design a species as well. Note that if you design a species from a survival point of view you can still make it look more amazing afterwards. As I said, many of the true survival aspects won't be of importance anymore, so they will have changed over time and this allows you to alter the appearance to something you like. Sometimes a species simply needs to look good. Survival or no survival, all of that might not matter in your story universe. All that matters is that they're in your universe and they look how you want them to look, the primal portion of their history isn't important. The way to create a species like this is still roughly the same. You could mix and match bits to get a rough idea of what works for you and what you might like in the end result or you could design from one end and work to the other. It's often more easier to start with the head as this is the main aspect of most species. It dictates how intimidating it looks, it's the part that shows emotions and it's sometimes one of the only parts that's actually visible when the rest of the body is dressed in clothes or armor. Some of you might have issues visualizing your idea and that's perfectly normal, not everybody sees everything clearly in their mind and this includes artists, so don't worry. There are a few ways you can visualize your idea to help get a better picture of what you (think you've) created so far. The first and most visual way is to actually create a visual version of it. It could be done by drawing it, painting it, creating a rough version in a game (like Spore for example) or even by making a rough version out of clay. It doesn't have to be very detailed and your skills will obviously limit how detailed you can get. But even something as basic as a somewhat detailed stick figure could help you get a better idea of what you want your species to look like. Another way which is visual as well, but doesn't require a lot of skill, is to make a collage. Cut out eyes, heads, ears, torso parts, legs and anything else you might need from existing art work and/or photographs and piece them all together to create a rough version of what you want. 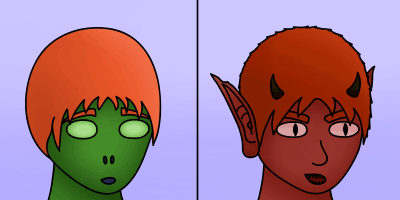 Doing this allows you to easily change small aspects for another to see how those would work, like changing smaller eyes for bigger eyes. If you're still unsure about how this works, search for 'face collage' in Google images and you should get what the idea is. Another and perhaps best way is to write it down. If you're creating a species for a story you're working on you're going to have to describe it to the reader anyway, so why not start with a description right now? It could be a basic description, like the one I gave earlier, you could even use simple bullet points to get the point across, or you could write a fully detailed description, ready for your story. Knowing how your species looks is one thing, but how does it move? How does it walk, run, sit, sleep, jump, attack and so on. It's a big factor of how a species will appear to the spectator, whether that's a reader or player of your game won't matter. Movement includes the smaller movements, like facial movement for emotions or the subtle movements indicating nervousness, like not being able to stand still or clenching your fists. It's a huge chunk of details to digest, but it's a good idea to think about this in the early stages, rather than trying to figure those out when you're actually writing or animating your species into your universe. Another major aspect is the way your species sounds. Guttural? Melodic? Or maybe something different and unique? For inspiration there's a whole world to explore, humans alone can make a wide range of noises and there's plenty of animals you can use as a basis for your species. You can also use less obvious sounds as the basis of the sounds your species makes, like burps, hiccups or the clicking sounds made by those speaking the Khoisan languages. You'll likely also want to develop at least a basic language, but this will be covered in a separate guide in the future. So by now you should have a pretty good idea of what you want your species to look like, maybe you already worked it out completely or maybe you still need to work out the finer details, but there's one more major aspect you'll have to think about, which is subspecies and races. There's a huge variety of looks a human could have, ranging from skin color to height, hair color and size. So why wouldn't this be the case for your species? Some stories also have subspecies, like the orcs and uruk-hai in Lord of the Rings, which is another aspect you might wish to add or at least think about adding to your universe. Adding diversity will make your world both richer and more realistic. Unless your species only lives in a specific area of your world there's bound to be some variation. There are a few more aspects which could alter the appearance of your species, most of which are related to its society, like wearing clothes, having tattoos and other body modifications and wearing make up. Other aspects which could alter the appearance is a need for survival (camouflage make up), scars from wars and battles, potential remnants of wounds (scars, lost limbs, etc) which might heal only partially or regenerate completely and a bunch more. Most of these aren't related to creating a species all that much, they generally develop on their own when you create the society your species belongs to and the world it lives in. There's a guide on creating societies right here and an expansive guide on world building right here, both of which could help you with not only the further development of your new species, but also with the development of your world.